Did you know that there were over 150 million pieces of direct mail sent out in 2015 alone? 42% of the recipients opened the mail, as well. It’s still a very effective strategy for acquiring clients and generating sales. It doesn’t matter if you run a digital agency, e-commerce company, or consumer brand. Everyone can benefit from using direct mail. Direct mail marketing is the process of mailing recipients offers, coupons, or sales letters directly to their physical mailbox. We’re so used to being bombarded with emails these days that it’s hard to remember the last time we received a promotion via letter. It has been the go-to strategy for companies around the world for decades. Before the crazy thing called the internet, direct mail was one of the best ways to reach customers. Besides radio or television, there wasn’t many other options. Now there’s Facebook, Pinterest, Instagram, Google, Twitter ads, and unlimited paths to take. Let’s talk about how much direct mail costs, so you can get a better idea of what you’ll need to invest. There’s no cookie cutter way to approach direct mail. You need to brainstorm the goals, budget, and other areas of your business to decide which route is the best. Budget: How much are you willing to spend? Those with smaller budgets will have to send out less mail, and may have to opt for small catalogs or designs. Audience: Do you have a narrowly defined target audience? Are you planning to send mail to previous customers to promote repeat purchases? Depending on who you’re selling to will also determine costs, as cold leads require more material to convert versus those already knowledgeable about your brand. Product: What are you selling will need to align with the packaging and design of the mail you send. A formal letter would be appropriate for business services for example, while a colorful and casual letter would be suitable for children’s products. A study by MobileCause found that direct mail tends to have the best results, specifically regarding open rates, when it’s mixed with other strategies. This means that you will want to ensure that you have a well balanced marketing strategy that consists of direct mail, email, and a website. Collect emails with a tool like Mailchimp, and learn the basics of inbound marketing if you’re not already practicing it. Doing this with direct mail on the side will yield the best results. With that being said, let’s talk about what goes into the cost of direct mail campaigns. Those with basic design skills shoulder consider lowering costs by creating advertisements by themselves. There are also templates available online that you can use to save time and energy. I’d recommend using a free tool like Canva. They have pre-made direct mail designs that will give a good boost to any campaign. The last route would be to outsource the design to a freelancer or agency. Take 99designs for example. They offer direct mail designs for $269, $399, $799, $1,299 with different packages. The most important element of direct mail material is the sales copy. This is why you need to hire a copywriter, such as myself, to ensure that you have copy that converts. It’s easy to think that you could muster up a couple thousand words and call it a day, but great copywriters understand the science of what sells. They use storytelling, calls to action, and other strategies to make the customer drool at the mouth before taking out their credit card. Avoid cheap writers, as the results will be very poor. There’s a reason that good copywriters charge higher rates: they deliver results. Sorry to say it, but you’re not going to find a writer worth your while that charges $0.5/word or minimum wage. You need to spend money to make money. Obviously you will need a list of recipients to perform direct mail marketing. This means that marketers will need to invest into a mailing list, unless they already have one they’ve created. Researching various mailing list companies, I found that they mostly require you to submit an application for a quote. This is because every business and campaign has different needs, so pricing fluctuates accordingly. 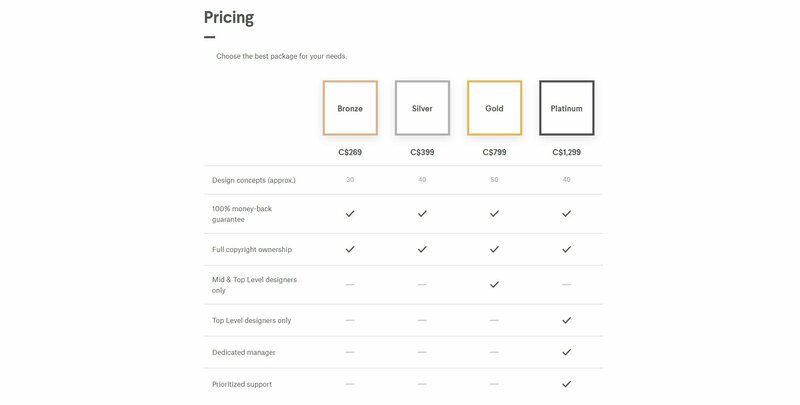 However, I did come across websites like Leadiro that have flat rates, as you can see below. It’s not uncommon to invest thousands of dollars for an email list because the ROI could be much greater. The quantity of what you’re printing. The size and quality of the paper you’re printing on. Whether or not you use color or only black ink. The final step of any direct mail campaign is to send out the marketing material. This, of course, requires you to pay distribution costs, which depend on postage prices, weight, and other factors. Consult with a local mailing branch to get an estimate of how much your campaign will cost. Now that you understand what direct mail is and how it’s priced, I’d like to educate you on the benefits of using this an advertising channel. Whether you collect your own mailing list or purchase one, it results in marketing campaigns that are highly targeted. If you have a very strict buyers persona and understand your ideal customer deeply, direct mail can be extremely lucrative. You aren’t sending mail to random people in hopes that they will buy your product. It’s being received by qualified leads that have a much better chance of converting. Imagine you sent out 1,000 flyers for the total cost of $5,000, and it resulted in 100 sales worth $50,000. That’s 10x your money, and it’s all thanks to direct mail advertising. Being able to track and measure a marketing campaign is often a hurdle for businesses. Direct mail bypasses this because the material sent out could include a special discount code or coupon exclusive to the campaign. Similarly, it may be one of the only ways a business markets themselves, so it’s simple to see the impact it’s having on sales. Once it starts having a positive ROI, start ramping up spending and sending out material to keep the revenue coming in. With the personal information of leads and a clearly outlined buyers persona, direct mail becomes heavily personalized. Your campaigns aren’t junk mail that get thrown away. Since they resonate with customers, mail is more likely to be opened and looked at in a positive way. You will be able to write copy, create images, and offer a product that relates to their interests. It’s been found that customers are more likely to engage with a brand that uses their first name, and 31% wish the shopping experience was personalized in general. Here are some of the most tried and true strategies for producing direct mail ads that convert. When you pick up a piece of paper and read an ad, it can be difficult to image a product or service. This is why as a marketer you need to use words to paint a picture in the customer’s head. Describe the product being used in vivid detail down to the emotions and thoughts a customer would have. 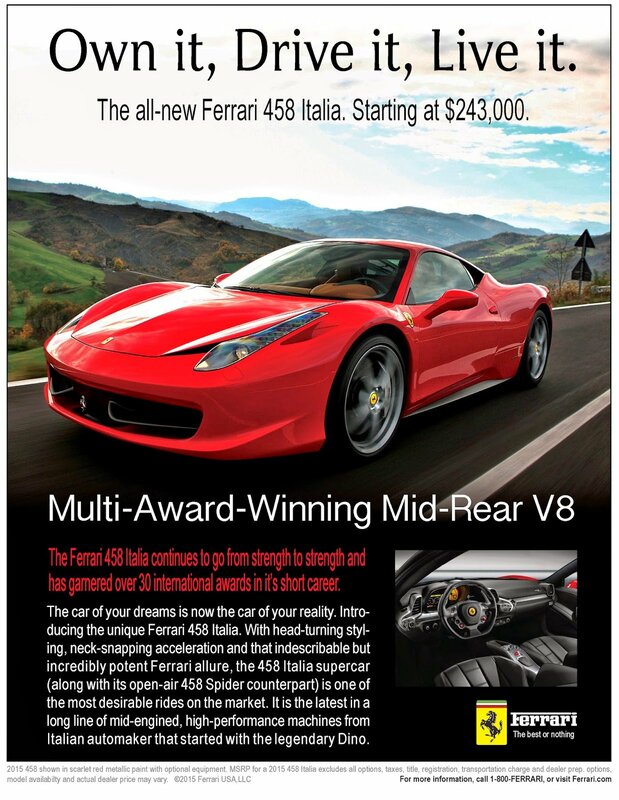 Look how Ferrari pulled this off in an ad for their 458 model. The headline “Own it, Drive it, Live it.” sums up the idea of having a supercar in one line. It’s an emotional experience, not just a vehicle. When you’re writing the copy for a direct mail ad, tell the story of using the product through the eyes of a customer. What will they experience? What feelings and thoughts will they have? These are questions marketers need to ask themselves. Copy without a call to action is like icecream without a cone. What’s the point? Calls to action are statements that tell customers to take to next logical step in the sales process. This could be visiting a website, placing an order over the phone, filling out a form, or similar. It will depend on the exact goal you’re trying to achieve with the individual campaign. Fear of missing out, or FOMO for short, is a social phenomena that all humans experience from time to time. It is the fear that we will miss out on a great opportunity if we don’t take action soon enough. As a direct mail marketer, you can use this to your advantage. Images need to be used strategically in all forms of advertisements. Focus on using images that enhance sales copy, and allow the customer to picture themselves using the product. Look at Nike, for example. 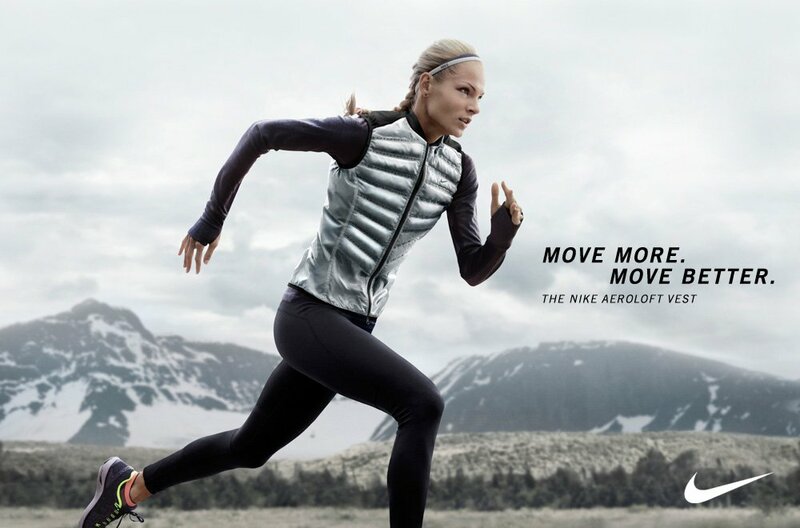 They showed a woman running with their Aeroloft vest in an ad for it. It’s a newbie mistake to write copy that only focuses on the features of a product. Features are factual pieces of information, such as material, color, or sizing. It will keep you warm when outside in the cold weather. It’s lightweight and layers easily with other clothing. It’s fashionable and makes you look better while exercising. Try taking the features of the product you’re selling, and elaborate on what the exact benefits are. That is what the customer truly cares about: how it will change their life and solve their problems. Direct advertising can have a great ROI, and could be the strategy you’ve been looking for. It is one of the oldest forms of marketing, yet still holds its weight in modern times. The cost of a direct mail campaign will depend on design, quantity, distribution, printing, and other aspects. These can lowered by doing some grunt work and completing it in-house. The benefits of direct advertising include its personalization, precise targeting, and the ability to be measured easily. I would recommend painting a picture in the customers head by detailing exactly what they will experience by using your product. Reference back to the Ferrari ad I displayed earlier as an example. Always include a call to action at the end of the ad, as well. Without one, customers could easily throw away the mail because you forgot to tell them what to do next. Using urgent words and phrases throughout the ad can entice customers to take action sooner, as well. Lastly, one of the most staple marketing strategies of all time us to focus on the benefits of what you’re selling. These are the experiences and emotions that a customer will have by using the product.